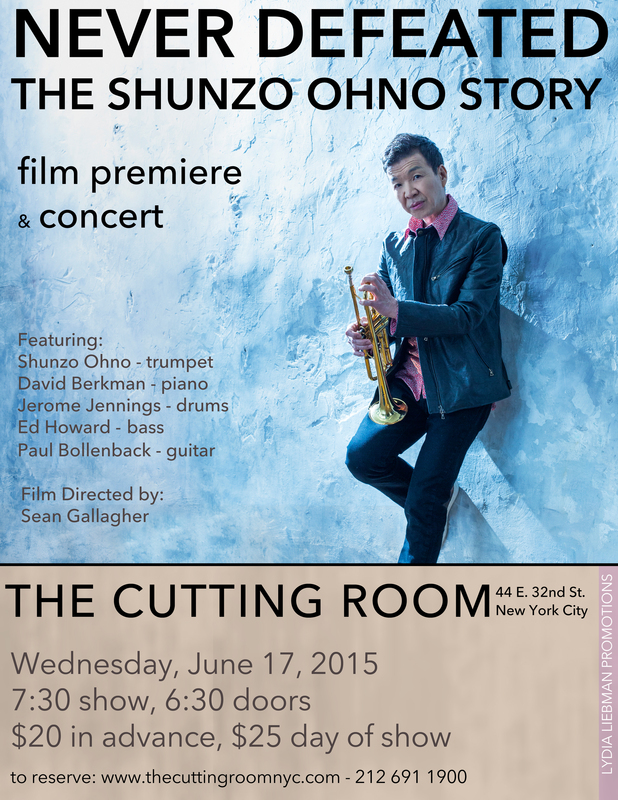 New York, NY- The Cutting Room, located at 44 E. 32nd Street, NYC, proudly presents Shunzo Ohno: Never Defeated Film Premiere and Concert on Wednesday, June 17 at 7:30 PM. Doors open at 6:30 PM. Tickets, which are $20 in advance and $25 day of the show, can be purchased online by visiting www.thecuttingroomnyc.com or by calling 212 691 1900.
International Award Winning Shunzo Ohno is considered one of the most versatile and influential trumpeters of modern jazz. Born in Gifu Prefecture, Japan,Shunzo’s rise to prominence began in 1974, when he accepted an offer to perform with the legendary jazz drummer Art Blakey. Following his tenure with Blakey,Shunzo propelled with a series of important collaborations, including ones with Machito and his Afro-Cuban Orchestra, Wayne Shorter, Larry Coryell, Herbie Hancock, and Gil Evans, who was a long-time collaborator of Shunzo’s. Shunzo has recorded 16 albums as a leader and has been featured on two Grammy winning recordings. Shunzo’s life, which is the subject of “Shunzo Ohno: Never Defeated”, produced by Sean Gallagher of WhatNot Productions, has been fraught with much adversity, including a serious automobile accident in 1988 and the diagnosis of stage 4 throat cancer in 1996. Through both of these tragedies, Shunzo managed to overcome struggle and redevelop his unique sound and musical voice. In 2014, Shunzo won the International Songwriting Competition’s grand prize with this composition “Musashi”, making Shunzo the first jazz recipient of this prestigious award. The documentary film “Shunzo Ohno: Never Defeated”, which features narration from the legendary bassist Buster Williams, will be premiered at The Cutting Room and followed by a live concert featuring pianist David Berkman, drummer Jerome Jennings, bassist Ed Howard and guitarist Paul Bollenback. “[Shunzo Ohno]… plays tight, crisply phrased lines with a stabbing rhythmic effect. Without the mute, his open tone has a broad, ringing sound that soars through high-powered driving lines….” The New York Times. Over recent years, Shunzo has been touring the globe, performing frequently in Hong Kong, Malaysia, China, Singapore, Taiwan, and Japan. He has been an avid supporter of the recovery efforts following the natural disasters in Japan and recently, Nepal. Shunzo is thrilled to return to the United States for this exciting tour. He will continue his United States tour with performances at The Bean Runner on June 27 in Peekskill New York and Jazz Forum Arts at Lyndhurst in Dobbs Ferry, New York.